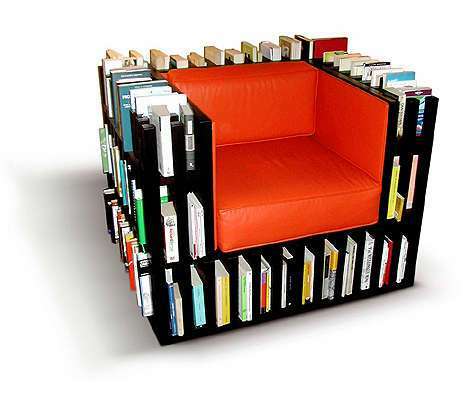 The geekiest furniture on earth! When it comes to home furnishings, you just can’t beat a bit of geek influence! Geek chic is a big and popular niche these days, and we think the geekier you are, the cooler you are! 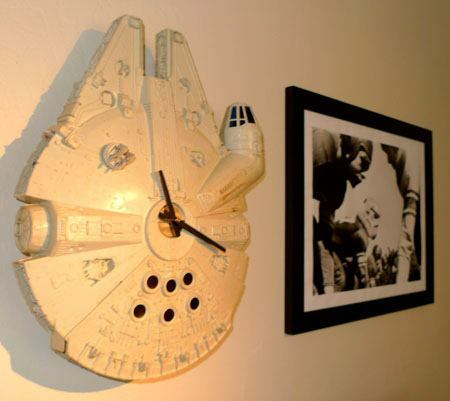 Here are some of our favourite geeky designs which will make your home great! This table is fantastic! Superbly functional and the perfect height for magazines and the occasional cup of tea, this fantastic looking kitchen table is nothing more than embedded computer mother boards overlaid with a glass top. So simple yet so effective. The top nerds out there can enjoy themselves trying to recognise motherboards they know and love! This is the perfect table for anyone whose life revolves around playing video games. This table looks just like an original Nintendo Entertainment System controller, and believe it or not, it actually works as a controller! the perfect combination of geek cool! this keyboard inspired bench or chair, depending on your size, is fabulous! 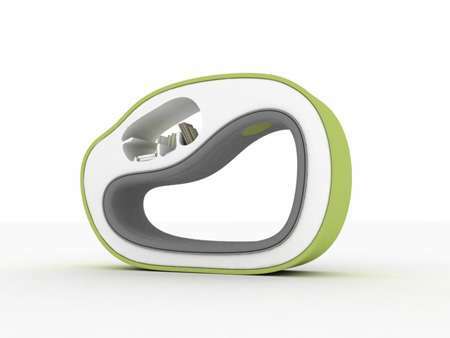 Ergonomically designed to be as comfortable as it is cool ,this is going to make a real geek statement in your home! The pixel sofa is an awesome combination of geek chic and true comfort. Because this particular piece of furniture only really takes its colour from geek inspiration, it means that it is every bit as comfy as any other settee. The pixellated design means though that it is a real riot of colour! You may have to be a certain age to really appreciate just how popular this game was on the Original Gameboy. Of course, that was a black and white hand held console, which didn’t really matter to the game play, but we’re glad that this table has gone against being completely faithful to the original Tetris and brightened itself up! It looks fantastic and would brighten up any geek’s living space! Amazingly this fantastic looking coffee table is nothing more than the efforts of a novice furniture maker! it just goes to show that if you have that inner geek mindset, you can achieve anything! There’s no way that any collection of geeky furniture could possibly be complete without a Rubik’s cube related object! this simple table is so striking and perfectly replicates the old children’s puzzle classic. we think that this table is even better, because you don’t have to try to do complete the puzzle! There aren’t too many things that can really add some artistic flair to your home, but a truly beautiful wall clock is one thing that will. We’ve scoured the Internet to find some of the most beautiful examples you could hope to find anywhere. This is such a clever idea and so beautifully realised. The clock is separate from the butterflies that have broken away from the clock itself. this is a really striking piece of design that we think would work in a whole host of different rooms. Although it doesn’t make much sense to have two clocks on one wall, we think it works really well with these fun running clocks! they look great on their own, but even better if they are chasing one another! It’s a great comment on time itself, and they look truly beautiful against a vibrant wall colour. this delightfully presented wall clock is a beauty to behold. It is so fragile looking and of course, everyone loves roses! It’s a really striking clock that is going to add a bit of lightness and delicacy to any room. We love this daily life wall clock. Not only does it have a subtle beauty, it is also representative of our lives, and that is always a good thing to be reminded of. Representing the earth in the centre with delightful outdoor scenes on the surface, this dark clock will actually bring light to your life. Using old vinyl is such a great idea when it comes to wall clocks, but very few people think to elaborate further. this example shows a delightful scene which is achieved by the artist carving sections of the vinyl out. A very skilled piece of work which looks fantastic. We specifically chose this wall clock for the collection because of its beautiful simplicity and geekery. This is something that anyone at home could do with a bit of patience and research. It looks beautiful, and it doesn’t have to cost you a penny! Dali was nothing if not a creator of wonderfully beautiful images and sculptures, and none more so than his famous melting clocks. As you can see from his original image below, this physical interpretation of his artistic creation is fantastic. The ability to place the clock on a shelf really makes it look like it is melting, which lends itself to true authenticity in terms of the statement Dali was trying to make. This is a great clock, because you can make it just how you want it! If you’ve got a big wall, there’s no reason that the number 4 can’t be eight feet away from the number 5 – as long as it falls in the right order. In fact, they don’t even have to be in the right order if you really want to be abstract. We all know that one comes after two, and so on and so forth, so really, the hands are the only pieces of information you need right? Get creative and make your wall exquisite with a clock like this. We think this is one of the most beautiful things we have ever seen. Designed by Paulino and Fusi, this is a cuckoo clock as you have never seen before. modern in design, it is a piece of art to enjoy in the home, as well as a reminder of the time! Built with an organic approach, this is as easy on the environment as it is on the eye. This is an amazing clock and a little bit different form all the others. The main difference being that this clock will have nothing to do with physical numbers! The time is always written out conversationally for you, which is a real novelty, and surprisingly easy to take in at a glance. On top of that, it is really quite striking, and very quirky. We think it’s a real winner! From the simple, purely functional and the ornate, to the bizarre and downright silly. Bookcases come in all different shapes, sizes and colours to meet our every need. Most people don’t give bookcases a second thought as furniture or art. They prefer to go for the boxy looking simple shelves available in most high street stores or prefer to dump their precious books on the floor or under the coffee table. But of course any true book lover out there would not do this to their beloved books and would prefer to house them in something, rather than in nothing! But what about all these book lovers that also love art or want something better than the bog standard book case? Do they build their own unique book storage or do they look for designer book shelves that come with the designer price tag? Well we have a few here that may be a little weird or even a lot weird, but none the less beautiful in design, in their own way of course! 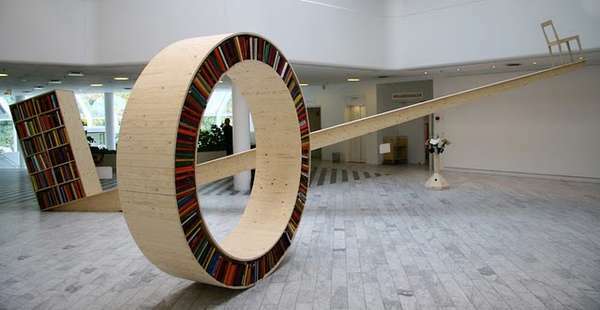 So here are the Top 10 Weird Bookcases…. 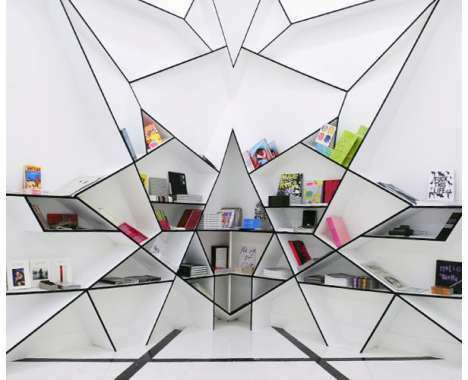 This huge geometric shaped bookcase would look more at home in a space station than in someones home. But this black and white book storage was made for the 2008 Art Show at the Art Basel in Miami. This massive show presented artwork from all over the Globe, including Sculpture, Video and Performance Art, The theme that ran throughout the show was black lines and a perfect ending to this show was this fabulous bookcase. 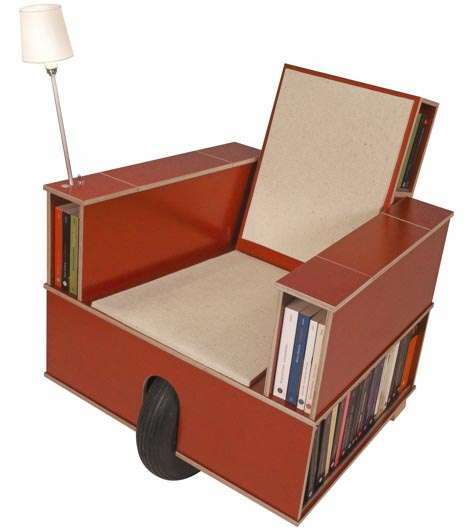 What a novel idea to combine a chair with a bookcase, that comes with a front wheel so you can move it to a different position more easily. It even comes with it’s own little reading light , which is handy during the darker winter nights. But it doesn’t seem to hold many books or even look that comfy. Wouldn’t you also be forever tripping over that front wheel or cleaning black rubber from your precious wooden floors? A must have for all Americans who love literature. 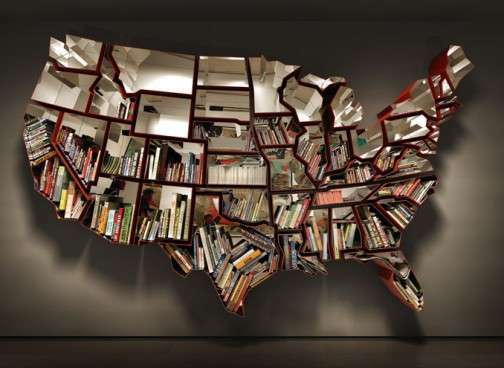 This fabulous handcrafted bookcase complete with all 52 States would look totally out of place in a normal 3 bed semi in Brighton. But if you give it the space and type of home that this beautiful piece of art deserves, I don’t think you could find a better one off piece than this! This gorgeous modern cell reading book shelf is the ideal getaway for lounging around reading your most treasured books. It comes complete with a reading light and padding all around the cell, so you can read in whatever position you like, even upside down. Although they don’t seem to hold many books, which is no good for the enthusiastic reader. This chair come bookcase is very handy for those people who lack space for a tall bookcase, maybe in their loft type homes with restricted ceiling height. Not only can you sit comfortably in this bold cube like chair but you can have all of your favourite books at your fingertips, with no need to even get up out of your seat! 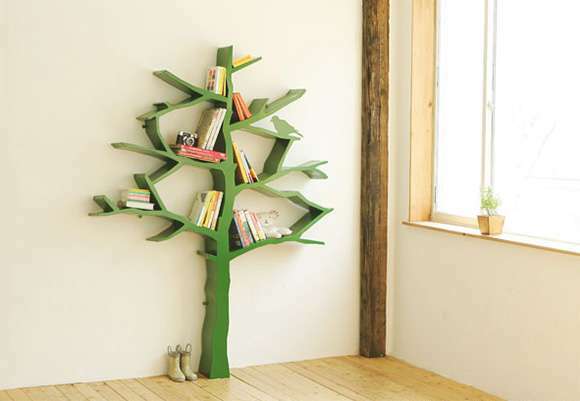 This Beautiful green tree shaped bookcase complete with small bird,makes a lovely addition to any child’s playroom or bedroom. A perfect place to house their nursery rhymes and bedtime stories and a great focal point in the room. Beautiful and simple bookcase design by Claudio Cigarro. The Profile bookcase is something you will never tire of, as you can constantly switch the pieces around to make something new and pleasing to the eye. It’s made up of numerous pieces that can fit together in many different ways. You can either make one large unit or dot various pieces around your home to suit your decor. Russian designer Tembolt Gugkaev has designed a very functional and aesthetically pleasing piece of furniture, ideal for book storage.The Wha Bookshelf is a perfect addition to the modern minimalistic homes or indeed offices of today. Not only does it look like art but it also creates a perfect space for bookworms who love to lounge, as the read their favorite novels. Made by BluBleu, this Thais Art Bath comes with beautifully hand crafted teak bookshelves, perfect for a relaxing read in the tub. This luxurious bath also features powerful jets to wash all the stresses and strains of the day away and can also be custom made to fit a particular space. Is that a piece of luggage? Or is it a comfy old settee fashioned in a rather unusual way? these may well be questions you are not used to asking yourself, but that is all about to change! Look below and you will find a fantastic collection of images the likes of which you will never have seen before! Always wanted to find a suitcase that conveniently transforms into a chaise longue before your very eyes? Look below for a veritable feast of luggage/furniture eye candy! This may look nothing more than a hastily assembled pile of suitcases to you, but in actual fact, this is an incredible creation from designer Eric De Nijs. Taken apart they are four fairly innocuous looking suitcases. Put together like a straight forward jigsaw puzzle however, and they make what is a somewhat fetching settee to help take the weight off in the departure lounge! Although on first inspection this very much appears to be a collection of suitcases, it is actually Belgian Designer Maarten De Ceulaer’s comment on the modern working man. It might just be a little bit disappointing to place your brief case on top of all of these, erm, briefcases when you get to work in the morning! There’s no getting away from the fact that this is form over function. there is no doubling up here. It may look like an old fashioned chest, and in fact it once was, but there’s no space for luggage now, and you won’t be taking it on holiday. So why is it included? One, it has been transformed from luggage into furniture by the immensely talented designer Katie Thompson, and two, we think it is the coolest micro settee going! You would have to have a heart of stone not to think that this is the most adorable thing you have ever seen! This is quite clearly the best possible use of old luggage bar none! We don’t recommend packing it up and taking it away with you though – excise and customs take a dim view of moggy smuggling! We live in a time where space is everything. the world is shrinking all the time. In some ways this is not such a bad thing, but when you cast your eyes on beautiful crossover pieces of luggage/furniture like this it makes you wish that some things were still so grand and decadent. this marvelous contraption is designed to be a foldaway make up station of truly sizeable proportions. In the good old days the nice train conductor would have found a spot for something as essential as this, if you were a person of means that is. We would love nothing more than to be able to fold away a trunk of this immense beauty and load it into the under-carriage of the next flight to the French Riviera, but somehow we feel that baggage restraints might just mean an empty handed arrival! The designers at James Plumb Design have come up with something truly delightful here – they have built the perfect wardrobe out of opulent old suitcases! Nothing more than a simple cabinet with a range of different coloured vintage suitcases in each one, this gives enough space for the most outrageous wardrobe – which is never a bad thing. These would look fantastic in any bedroom and would make a real talking point in any home. A beautiful design which really does give a fantastic use to an old design classic, the 50’s suitcase!